If we were to discuss major operational changes over the last 10 years in aquatics, it would be hard to think of anything more prominent than anti-entrapment compliance. As of Dec 2007, the United States federal Virginia Graeme Baker Pool & Spa Safety Act catapulted anti-entrapment risk management to the attention of aquatic operators and health inspectors across North America. The AB pool standards have been heavily influenced by this American policy change. When we talk about anti-entrapment, main drains on the pool floor immediately come to mind. However, anti-entrapment refers to all submerged suction fittings. This includes vacuum ports and equalizer lines. Almost all pool fittings sold in Canada are designed and/or manufactured in the United States, it’s very difficult to find any suction fittings on the market that are not compliant. The reality is most pool main drains in Alberta at this point in time are in compliance, sometimes the compliance can be difficult to assess (we’ve developed the Anti-Entrapment Evaluator™ report to help with this) but as time goes on and our awareness improves we are finding unique situations that are not compliant with the current standards. Suction lines for jet pumps and feature pumps are often forgot about since there is typically no flow meter present on these systems, the false assumption is that the flow rate on the filter flow meter is telling us everything we need to know. Another area of trouble is with equalizer lines. If your pool system has wall mounted skimmer fixtures, there is an equalizer port inside (figure 1). 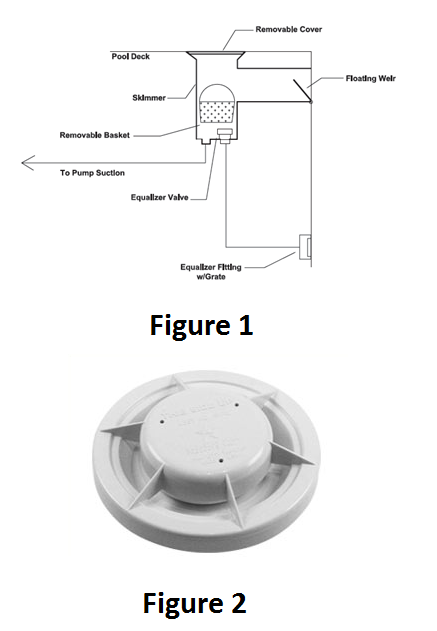 Manufacturers recommend the rear port is connected to the filter pump suction line and the front port (closest to the pool basin) is connected to a wall fitting approximately 1’ below the skimmer mouth. If your skimmer has a functioning float valve (under the basket – figure 2), a drop in water level causes the float valve to drop and create a seal that connects the pump suction port to the equalizer port which allows the pump to safely run without cavitation as long as the water level remains above the side wall equalizer fitting. At this time, the equalizer fitting becomes a functioning submerged suction outlet complete with a risk of entrapment/enlargement. Hair entanglement is the leading cause of pool entrapment – excessive velocity pulls a swimmers hair through the grate, causing it to swirl and become knotted on the other side. (WHO 2011, ASPE 2013). Without a functioning float valve, there is no connection between the pump suction line and the equalizer wall fitting. An open equalizer line disconnected from the pump still allows a marginal benefit from an equalization of the water level between the pool basin and skimmer, allowing the water level to drop just a small distance below the skimmer mouth before cavitation becomes an issue. It is becoming more common to see equalizer ports on the skimmer tied into the floor main drains which eliminates having additional submerged suction fittings. When anti-entrapment first started gaining momentum as an issue, many manufacturers were quick to design and manufacture approved retro-fit suction covers which have no doubt lead to selling a lot more replacement pool fittings. Retro fit equalizer covers are a little more recent on the market and there several to choose from, if you want to look at your options just call our office and let us know what kind of skimmer you have along with a picture of the existing equalizer wall fitting and/or cover that is currently installed. One option to deal with compliance is to disable the line – as per the 2014 AB Pool Standards. Technically you could argue the equalizer line is considered disabled if there is no functioning float valve present – without the float valve there can be no suction connection and therefore the equalizer line is no longer a submerged suction fitting. The open line between the pool and skimmer allows chlorinated water in and out to prevent unwanted bacterial growth from occurring. You will want to discuss this option with your health inspector as it may not be considered ‘permanently’ disabled. The best option is to keep your float valve and equalizer line in place as it was originally designed to prevent pump cavitation. 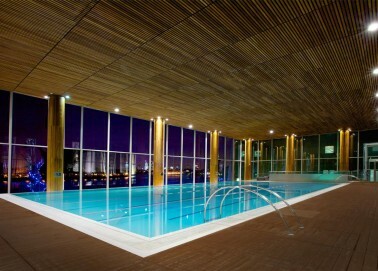 More pools these days rely on automatic water level control systems to ensure the pool has enough water to function. Should your level controller fail, the water level can drop below the skimmer opening after a couple days of heavy use. Approved retro-fit equalizer covers are readily available to adapt to most configurations. If for some reason there is no available retro-fit option you may have to consider plugging off the equalizer line. For this to be done correctly, the pool water level needs to be lowered so the line can be completely drained and dried out. A plug is required on both ends otherwise the end of the line will become a dead spot and an area of potential bacterial growth that can eventually contaminate the rest of the pool, we do recommend against this as some types of skimmers are more sensitive to the water level and symptoms of cavitation can be experienced from the turbulence of splashing at water levels that are just slightly below normal operating. Just like with main drains on the pool floor, anti-entrapment compliance for equalizer lines is an ongoing responsibility. The risk is not totally mitigated once approved covers are installed. We strongly recommend that the designated operator communicate to all involved staff about the importance ongoing anti-entrapment assessment. We all know how important it is to test the water before allowing bathers to use the pool, a good practice for safety and risk management is to also ensure your submerged suction fittings are present and in good working condition. While entrapment & entanglement incidents are rare, most accidents are due to missing or damaged covers. World Health Organization (2006) Guidelines for safe recreational water environments. Vol. 2. SWIMMING POOLS AND SIMILAR ENVIRONMENTS. Geneva, World Health Organization.